The British Army launched a television advertising campaign designed to keep British soldiers alive on the road. Research showed that British soldiers are twice as likely as civilians to die as a result of reckless driving, because they have difficulty adjusting to normal life after returning home from active duty. A series of videos were produced to be shown on BFBS TV (British Forces Broadcasting Service) and also to soldiers during the process of their reintroduction to civilian life. Two of the spots, Autobahn and Debris, won Gold Film Lions at Cannes International Advertising Festival 2009. “Autobahn” aims to alter soldiers’ behaviour, telling them just how likely they are to have an accident. 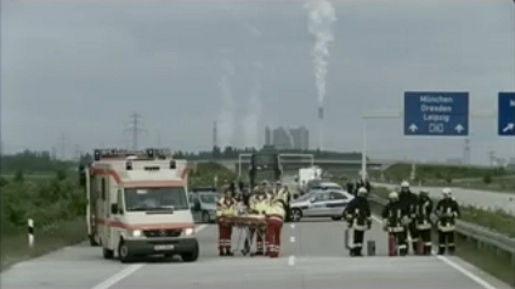 Emergency services and other people getting into position to view the obligatory accident. Ride Carefully, You’re Tough But You’re Not Invincible. “Debris” aims to alter soldiers’ behaviour showing them the impact their death would have on their family. See also Grim Reaper and This Was My Life (not suitable for sensitive viewers). The Traffic Accident campaigns was developed at Golley Slater Group, Cardiff, by copywriters/art directors David Abbott, Phil Hickes, Paul Williams, planner Leanne Ellis, and agency producer Sinead Phillips. Filming was shot by director Seb Edwards via Markenfilm, Hamburg, and Academy Films, London, with director of photography Martin Ruhe, producer Simon Cooper. Post production was done at The Moving Picture Company. Editor was Sam Rice Edwards and Nik Hindson at The Assembly Rooms. Sound was designed by Andy Humphreys at 750MPH.